Well, it’s here. Reveal day for the Spring 2017 One Room Challenge. Our master bedroom has officially been made over, and man am I ever glad. It’s totally one of those rooms where I’m now kicking myself for waiting 2+ years to tackle it. 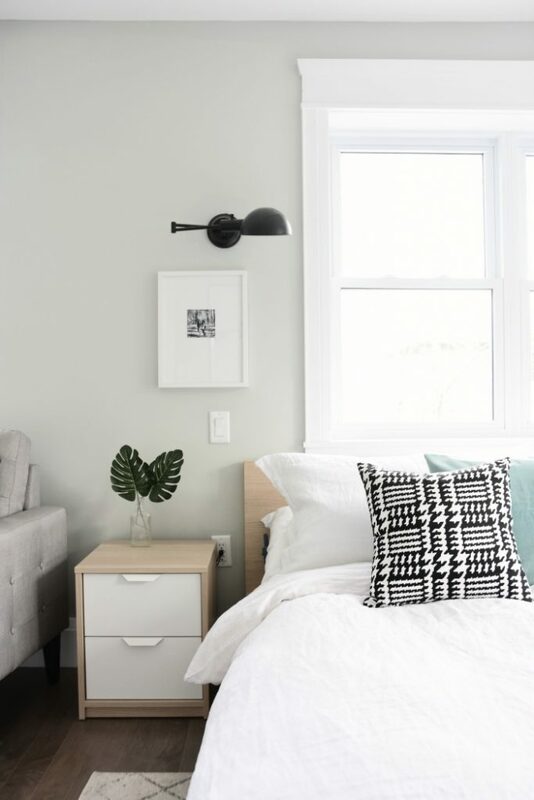 We ended up with a neutral, un-fussy, kind of eclectic, calming bedroom that just feels good to be in. We didn’t break the bank with any of our purchases and definitely DIY’d where we could. I love a good before and after side by side shot, so let’s start with those, huh? Here we are before. So uninspiring. More contrast. More cozy. Fresh and bright. And the reading corner (slash Dan’s closet). Just all together BAD. Building out and painting the wardrobe made such a huge difference. And it’s so nice to have that cozy chair and pouf to really define that part of the room. I know where I’ll be having my Saturday morning coffee next weekend! Here is my biggest tip when decorating a bedroom: Symmetry. 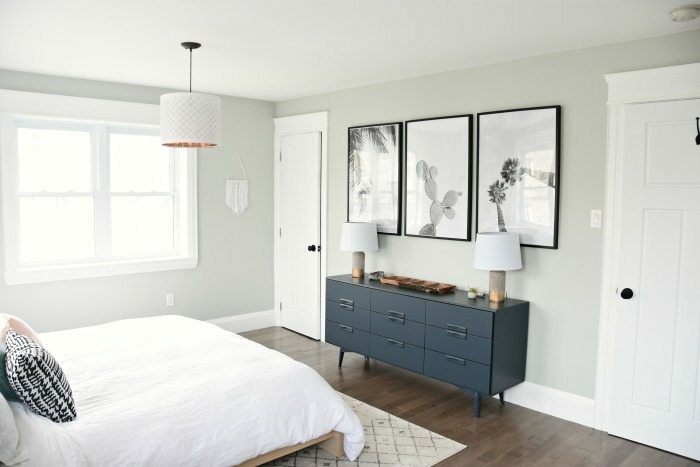 Something about having everything as symmetrical as possible makes any room (and particularly a bedroom) feel organized, put together, and like it makes sense. This room is long and narrow and there are some elements that work against symmetry. But everywhere I could, I created balance. Like for instance, centering the dresser between the doorways and having the three engineer prints centered above that. Plus the two table lamps on either side of the dresser (I’m not a good dresser/shelf stylist, and the two lamps thing seems to be an easy go-to trick to make it look good). 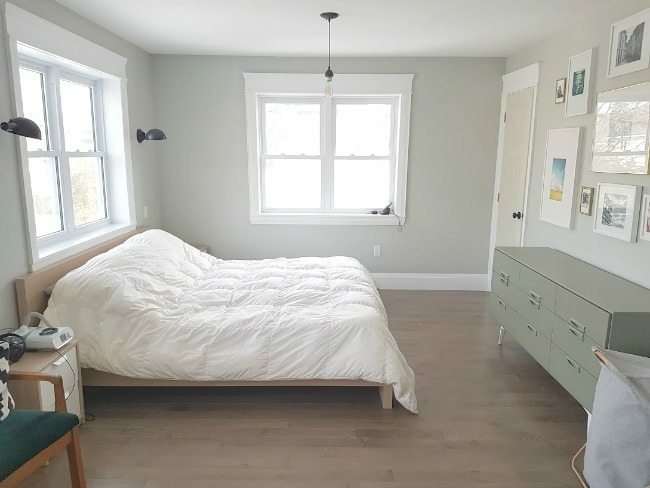 We placed the bed right under the window, with two sconces and two picture frames on either side, matching night stands, a pendant hanging directly in the middle of the bed, and the rug positioned exactly centered on the bed. See what I mean? It’s all about symmetry. Let’s chat about the lighting for a sec. 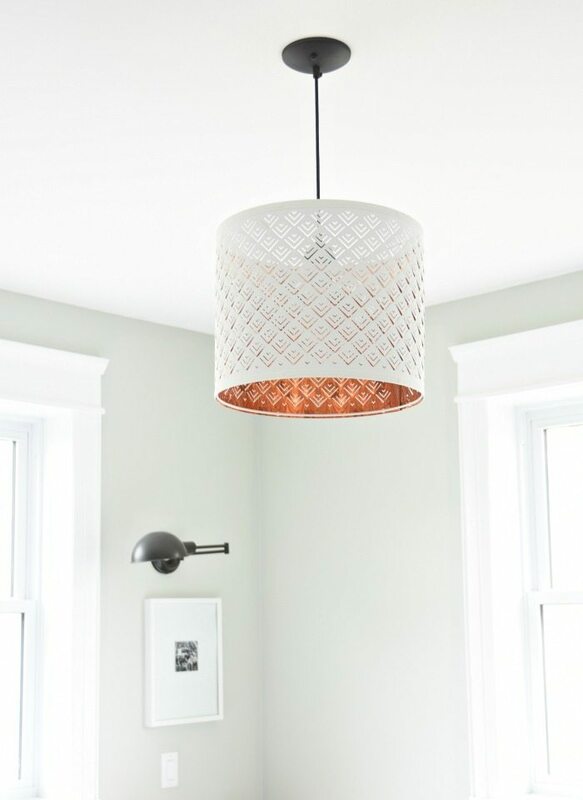 Another tip is to layer in lighting in a room – don’t just have one light, try to have multiple lights with different intensities and purposes. 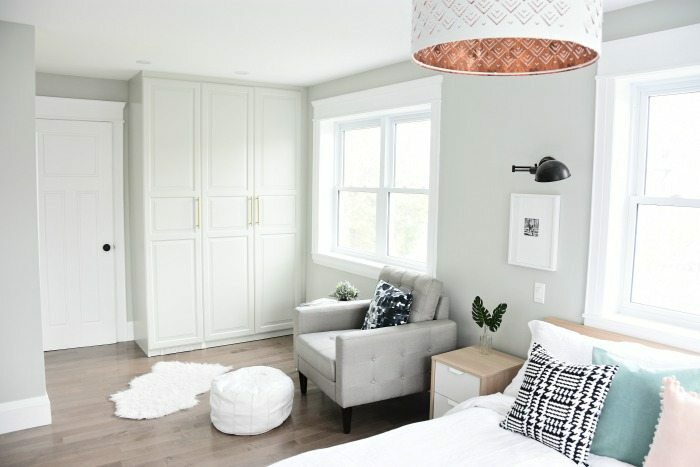 The black sconces are from Wayfair and we LOVE them (they are also waaay cheaper than most of the swing-arm black sconces out there!). They aren’t actually new – we put them in 2 years ago when we did our renovation. They have been great. Quite bright and perfect for being able to adjust placement for reading. The pendant above the bed was just a hardwire light kit (we got black, but they have tons of colour options), with a drum shade (the “Nymo”) from IKEA. I loved the white with subtle cut-out detail, and obviously the gold metallic on the inner side. It doesn’t let off tons of light (just one bulb), but it’s a gorgeous reflection. There are built-in potlights in the room, and we also layered two table lamps on the dresser across from the bed. The table lamps were concrete ones that I had bought at Target ages ago when it was still in Canada, and I painted the bottom gold with this liquid gold leaf. 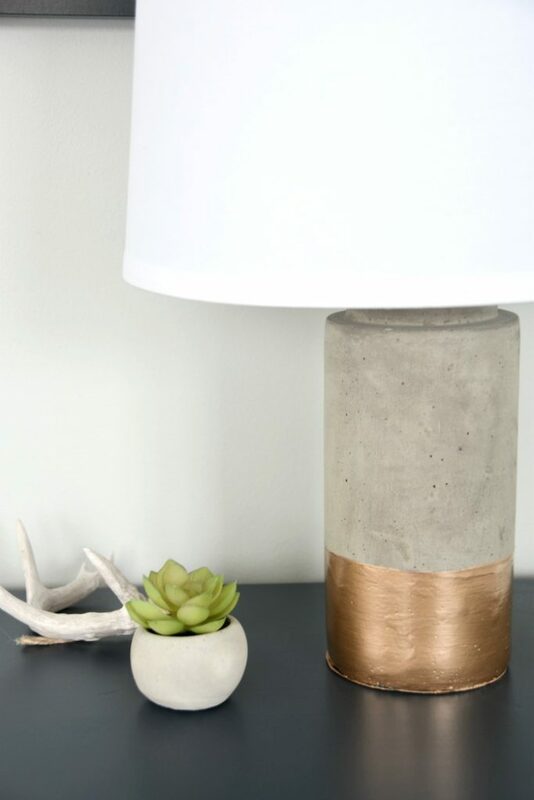 If you didn’t want to go the DIY route though, I found a few other similar lamp options at a great price: these really pretty concrete and gold lamps, these rectangular concrete lamps, these gold geometric lamps, and these very similar concrete and gold lamps with black shades (comes as set of two). I’m going to do a whole post on it soon, but I found the most budget-friendly 100% linen white duvet cover on Amazon and am OBSESSED with it. It feels unbelievable, I love the relaxed look, and I know it’ll just get better with age. I completely recommend it (comes with two shams and in other colours, too). We also grabbed some new crisp white sheets from Wayfair. They are ridiculously soft – the softest I have ever had – and wash well (they wrinkle though – so you need to either be OK with wrinkles or take the time to iron). In terms of throw blankets and pillows on the bed, we wanted to keep it from being overly fussy. I grabbed this pink fringed pillow because I adored it, and then paired it with some pillows that I actually already had in our linen closet and weren’t being used. 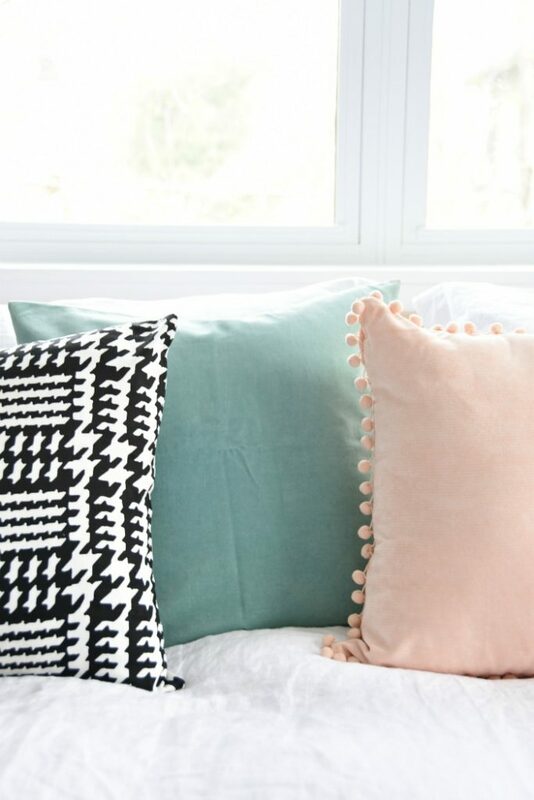 The blue velvet one is from IKEA, and the black and white ones were some that I had made ages ago with remnant fabric, but these black and white geometric pillows are a similar alternative. I like the pairing of two solid colours + some graphic pattern. It doesn’t feel over the top or too matchy-matchy. All in all, both Dan and I are super happy with how it turned out. 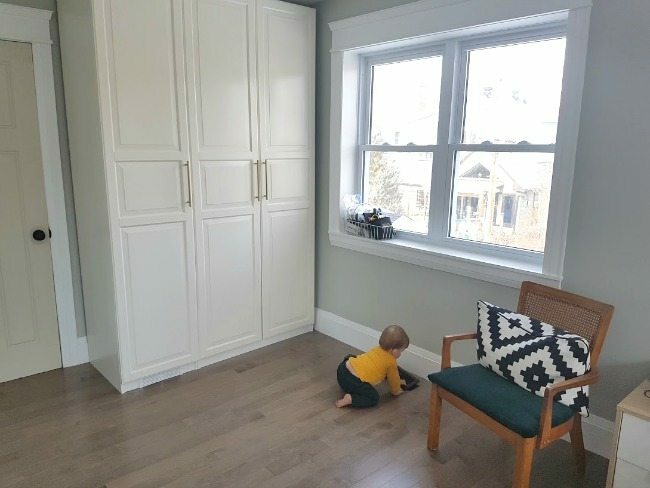 The only last thing on our list in this room, which we didn’t tackle during this makeover, are some blinds for the windows. We are saving up for motorized blinds that are pretty pricey – so we will get to that once we are able to! We didn’t want to waste money on blinds “for now”, since it doesn’t actually bother us to not have window coverings (are we risque or what?!). Ha. Hopefully our neighbours can’t see anything. We kept to our budget in this room. We chose budget-friendly retailers and didn’t make any over-the-top purchases. We DIY’d where we could, upcycled, and shopped our home for accessories. From Wayfair –> The rug (looooove it), black sconces, gray upholstered chair, white leather pouf, white sheets, and pink fringed throw pillow. Wayfair has an amazing selection of budget-friendly finds. I really couldn’t believe the price of the rug. 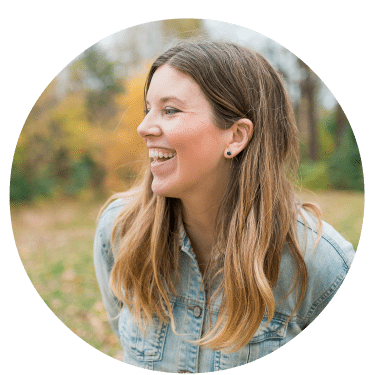 It can be nerve-wracking to order things sight-unseen, but each piece we ordered we were super happy with. From IKEA –> The “Malm” bed and nightstands, small white faux sheepskin rug, “Ribba” picture frames, white pendant shade, and “Pax” wardrobe. Thrifted –> The dresser was an upcycled find from Kijiji (found for $40). DIY Art –> The engineer prints were printed at Staples for $3 each (cactus print, palm tree print, beach print). I made the white yarn wall hanging with materials I already had (will post that DIY tutorial soon!). From Amazon –> The white linen bedding and gold hardware pulls for the closet were both from Amazon. Both incredibly budget friendly finds. So nothing over the top expensive, but it still feels collected and curated. I think having those personal art pieces plus a few DIY items (like the dresser) in the room make it seem more personal and eclectic, without having to break the bank. Want to shop the room? 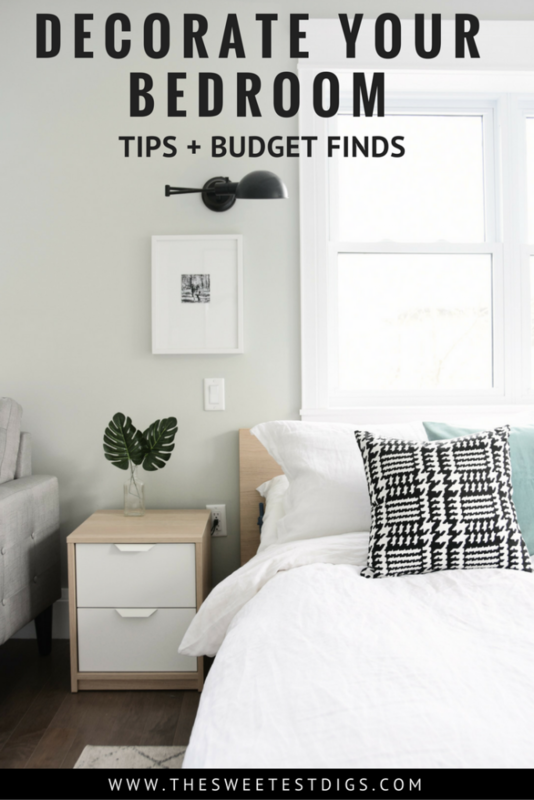 A huge thank you to Wayfair for collaborating with me on this One Room Challenge. I love partnering with them and hope you guys get some great ideas for your own homes. They have so many amazing products for just about every area of your home! 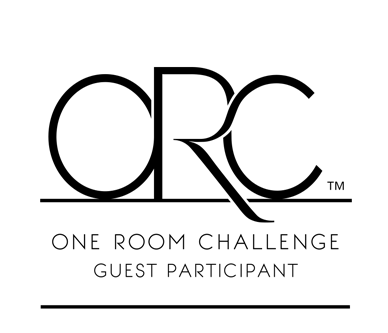 A big thanks to Linda from Calling It Home for hosting yet another great season of the One Room Challenge. Head on over to checkout all of the other participant rooms! There are some seriously inspiring spaces. And lastly a big old hug from me to you for coming along for the ride. Hope you enjoyed the makeover, and stay tuned for more room makeovers to come. 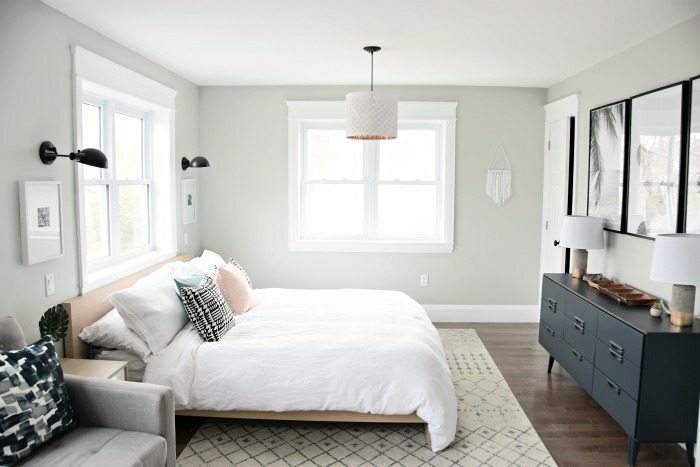 This bedroom refresh has me motivated to tackle some of the other unfinished spaces in our home! love the fresh, modern feel! it looks amazing! 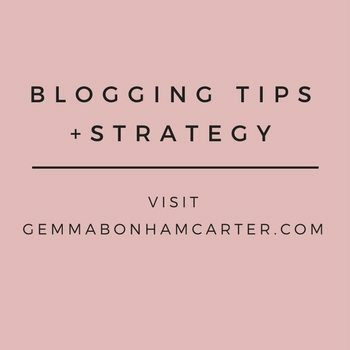 It looks amazing Gemma! So calm and cozy and well put-together! Wow looks soo good! I love the separate dressing area and the colour palette overall. Thanks Andrea! Me too – nice to have that separation. 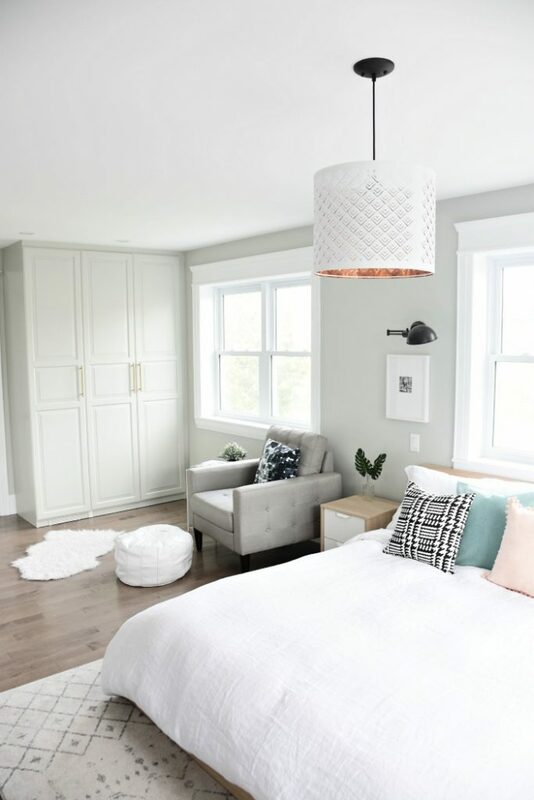 What a lovely calm space…and that dresser is just gorgeous!!! I love the navy too. Thanks Lidia! You did it again! 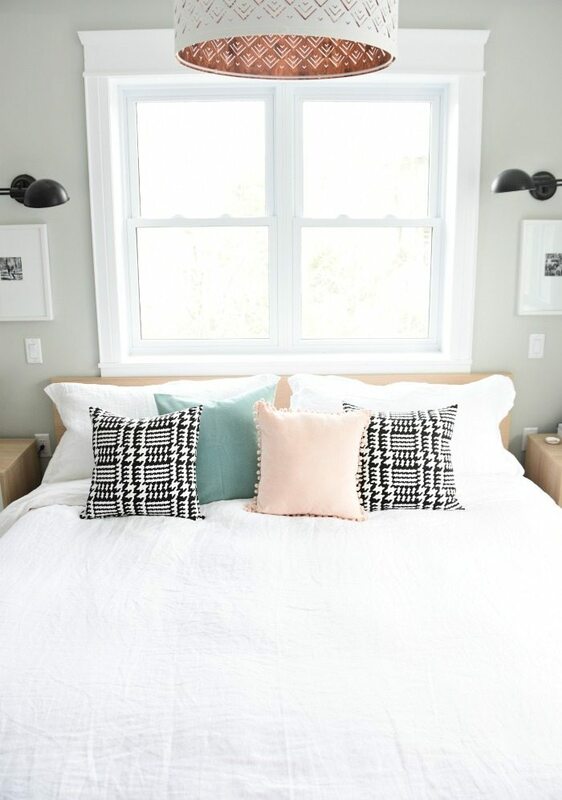 Such a fresh room makeover, and I love the pillows you chose for the bed! That pax hack is incredible, too!!! Your bedroom looks great! Such a bright and happy space! Great job!